Hidden in the towering Himalayas lies Kyrat, a country steeped in tradition and violence. You are Ajay Ghale. Traveling to Kyrat to fulfill your mother's dying wish, you find yourself caught up in a civil war to overthrow the oppressive regime of dictator Pagan Min. Even a slightly improved story can't save this from being more than just good. Some of the emergent gameplay is far less fun the second time around and the systems feel more tedious now than fun. This was my first Far Cry experience, so unlike many others having come from FC3, I was blown away. As always, the modern Far Cry games are polished and enjoyable gameplay experiences. Tons of cool stuff to shoot, and cool stuff to shoot it with. 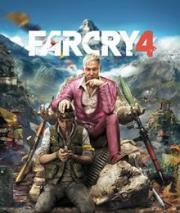 Ultimately, Far Cry 4 is just a better version of Far Cry 3. Could call it Far Cry 3.5. Story is nonsense as per usual. More of the same. Not exactly a bad thing, considering Far Cry 3 was near perfect, but the main antagonist lacks the charm of Vaas, and none of the characters feel interesting enough to care about. Gunplay is good enough, and the plot moves itself along nicely. But as said before, this is too much like its predecessor to feel like a great game. Basically a rehash of 3 but with more vertical bits. A lot of fun but the Far Cry formula is becoming far too transparent. Don't think I'll be picking up Far Cry 5 anytime soon. wears thing really fast. also wastes one of the best villains in ages by essentially turning him into a background character until the end of the game. fun for fans of digital cartography. Sorry, I love these games. Its repetitive horrific violence and sneaking and hunting and it's a blast.